I spent last week with Abby and Kelly down in the frickin’ steamy city of New Orleans. We figured since it was already going to be hot at home in Louisville, why not be hot somewhere fun. Good in theory. Good in fact. But I was so sweaty and sticky you could have boxed and marketed me as a Slip’N Slide. As expected, I have dozens of photographs to sort through. Some are nice. Some are not so nice. (All that sun just messes with my DOF mojo.) But for now, you get a glimpse. But yes. We sat in a bar. In the dark. While a woman played the piano and sang “I Say A Little Prayer”. The Voodoo was delish but the vocal stylings of this woman were… probably only loved by few. Angie - Love that you went to NO for vacay! can’t wait to see more photos! Wendi @ Bon Appetit Hon - You put that fried dough picture up just for me didn’t you? Vacation food rocks. omawarisan - Marie Laveaux’ ? Amy - Beignets! The St. Charles line! Hurricanes! I LOVE NOLA! I miss it so. Been there for Christmas, Halloween, my senior trip, my honeymoon, and multiple other times. And yes, August is the worst time to go. Sorry! But it is still fun. So jealous. I’m not such an expert that I can guess what bar you were in just by the candles on the tables, however. I’ll take a wild stab in the dark (ha, ha, dark. get it?) and say The Krazy Corner?? Brooke - @Angie – Remember what I said about the sorority convention there… hot messes all over the French Quarter… b-a-d! @Amy – That was the St Charles line! 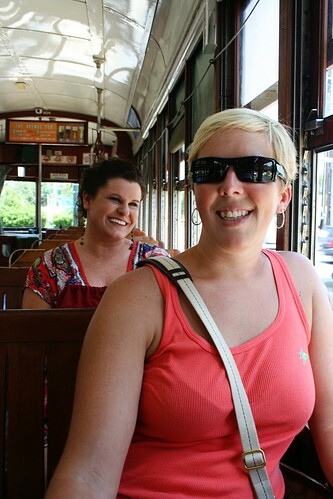 We went to the Garden District for a day and rode it all the way Uptown. :) But no, not the Krazy Korner. I will say that KK had an awesome band one night that played hella Bon Jovi though. Melissa - you are in that creepy little run down voodoo bar? I don’t know the name of it, but I have been there and it was darker than hell! and dangit boy, I love that town. Thanks for making me wanna hop a train and go! rachel - Hey, I know what you mean about the heat messing with your mojo. I usually love to snap away when we are camping, but the heat just took all of the fun right out of it. I hope to be going to NO myself around Halloween. I say hope because I don’t know if we can afford it or if I will have to work yet. ;) We seriously need to hang out sometime soon. Brooke - @Melissa – They served voodoo drinks but I wouldn’t consider it a voodoo bar… it’s known for something else. Debbie - Ohmigosh, I spent last week in Gulfport, MS, just a stone’s throw from where y’all were!! What a tiny world we live in! 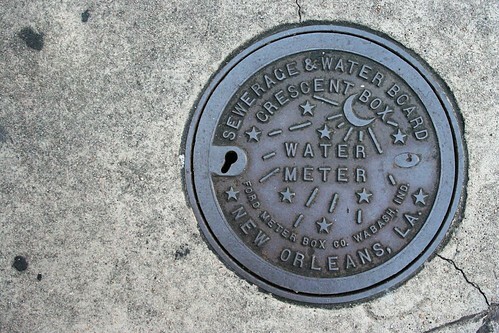 Loved the photos — brought back so many wonderful memories spent in N.O. Brooke - @Debbie – So were you guys toasty little suckers in Gulfport like we were? Totally skipped the whole glowing and perspiring thing… was totally sweating like a donkey. Denise - Looks like a fun trip! I soooooo wanna go some day. Walker - Cafe DuMonde… one of my favorite New Orleans spots. Great photos. Jun Belen - Oh my…. 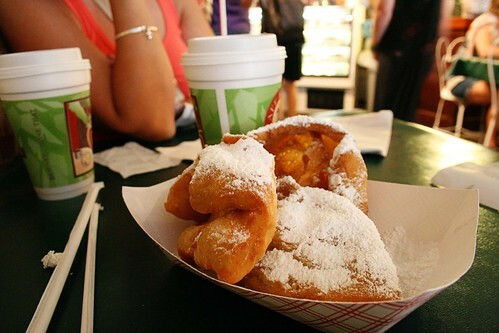 I love Cafe DuMonde’s beignets…. I can eat those all day! !